Nikon F301 | What's (in) the Picture? The weekly theme is ‘scale’. 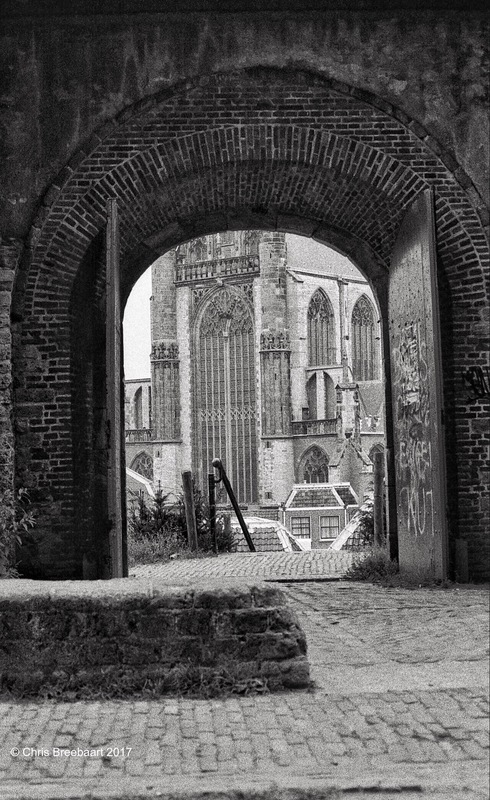 An old photo taken in February 1991 through the gate of De Burcht in Leiden, The Netherlands looking at the Hooglandse Kerk. I browsed my archive for pictures to publish. Some of them are partly retouched but most do have scratches, dust and stains. Originally shot with Nikon F301 on Kodak TriX, scanned from negative and tweaked using Snapseed and Marksta. Click the picture for a larger version. Air you can see – Oh, border! Ouch!! My back hurts!! On a Scale of One to Five! Midlife Crisis Crossover! Scales of Danger! Tales Of Mindful Travels WordPress Photo Challenge: Scale! Scale – Weekly Photo Challenge – Tea, Wine, and Cheese, Please! Tuesday Photo Challenge – Sand – Dutch goes the Photo! I browsed my archive for pictures to publish in – an originally – small series. That series caught on a bit more than I thought. All of them are not retouched yet. Scratches, dust and stains are not removed. Shot with Nikon F90 on Kodak TriX, Nikon F301 on Kodak II colour film and scanned from film and edited using Snapseed and Marksta . Click the picture for a bigger version. This weekly theme is ‘the gathering’. I thought I would not post more of these apes but this one fits the theme of this week. And it is the last one I took from my archives of the Apenheul in Apeldoorn. It is a monkey’s tale. thephotoseye Together….a gathering of the minds…..
decocraftsdigicrafts WPC: Mute Swan Family Gathering. This weekly theme is ‘oops’. I thought I would not post more of these apes but this one fits the theme of this week. And I say ‘oops’ to myself for having to publish another lovely creature from the Apenheul in Apeldoorn. And the ‘oops’ origin is out of the image, just wonder what the litlle one saw? Mirth and Motivation Weekly Photo Challenge: Oops! tassitus WP Weekly ~ Oops! 100 Days of Sunshine Oops! Journeys with Johnbo Weekly Photo Challenge – Oops! stenoodie Weekly Photo Challenge: Oops! One Foot Out the Door “Pics or it Didn’t Happen” – Oops! Words & Pics Ooops! Is that all there is? Lins Doodles Weekly Photo Challenge – Oops! Mary J Melange Soft “Oops” Kitty! The Ultimate Fundraiser Blog Oops! THE PETALUMA SPECTATOR PHOTO BLOG WordPress Weekly Photo Challenge–Oops! Anvica’s gallery Weekly Photo Challenge: Oops! Colonialist’s Blog Really Awful Oopsies. Adhika Lie No hands, mom! Book, Search, Journey WPC: Oops! A Vital Recognition Errant Tongue – Weekly Photo Challenge: Oops! So where’s the snow? WPC Shedooops! My Point of View Oops! In Da Campo ¡uy! ¡oh! ¡ay! Cee’s Photography The Daily Post Weekly Photo Challenge: Oops! cambodian beginnings Face of the Day: Oops! The Wandering Poet DP Photo Prompt ~ Not so oops! Ohm Sweet Ohm WPC: Oops! Matt von P weekly photo challenge: oops! This weekly theme is ‘eye spy’. Here I did the spying; a man during a sale in a shopping mall. It looks like he is waiting till he gets picked up and is killing time on his smart phone. Shot with iPhone 5s using Huemore edited using Snapseed and Marksta Click the picture for a larger version. Pics by Kaz Eye? Aye! This weekly theme is ‘eye spy’. A last one of the Apenheul in Apeldoorn. La vie est trop courte pour boire du mauvais vin Don’t Look Behind you! Bug Eyes! Santa’s Reindeer I’m watching you…. Links, Notes, Bookmarks & Briefs For December 5, 2015 What Constitutes Terrorism? Ouch!! My back hurts!! Eye Spy! The Hempstead Man In the Blink of an Eye. Words & Pics Look at me! Pebblestone Steps. Photo Challenge: Eye Spy. lifelessons – a blog by Judy Dykstra-Brown Eye, Eye, Eye, Eye! This weekly theme is ‘eye spy’. A cute looking ape in the Apenheul in Apeldoorn ready to get some food. This weekly theme is ‘eye spy’. A thoughtful observing ape in the Apenheul in Apeldoorn. PURSUIT OF HAPPINESS I can’t believe how this world changed! Terrible! @vannilla The eyes have it….. Ouch!! My back hurts!! Eye Spy? bambangpriantono (Weekly Photo Challenge) : Eye Spy – Miaaww…Can I get some? follow the ant trail Who’s got the biggest eye? in medias res Self Portrait? sparksfromacombustiblemind The “eyes” have it! Mind and Life Matters Through His Eyes! The Sunny Narrative. Avengers Assemble! This, that and the other thing Weekly Photo Challenge: Eye Spy…The eyes have it. Laura Gabrielle Feasey Literary Lion. I see you. This weekly theme is ‘trio’. Keep it simple: three apes in the Apenheul in Apeldoorn. This weekly theme is ‘victory’. Like other times it was not difficult to pick a photo. Yesterday evening the news of what happened in Paris was outrageous, sick. The theme got a question mark: who wins, who loses? What is won, what is lost? Is there a way to create a victory where all are winners?